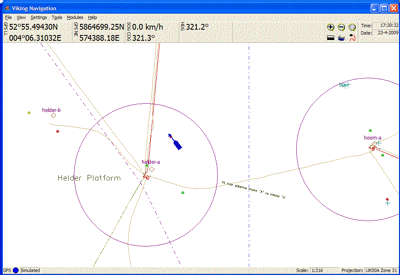 The Viking Navigation software package has a very rich and long history, and is built on long experience. For many decades our Viking Software has already served on a multitude of vessels and industries all over the world. Viking Navigation is targeted for use in all professional nautical industries, which include offshore, dredging, hydrographic survey, commercial fishing and marine construction. Viking can connect to virtually any GPS receiver and compass device, providing a solid base for every navigation requirement. By providing a clean and simple user interface Viking can be accustomed to in just a few minutes. The tools most often used can be found directly on the screen, and by using the menu bar all further functions are easily accessed. Viking provides extra sidebars for more directly visible and ready to use tools. The sidebars can be turned on and off, any time when needed, by a simple keypress. 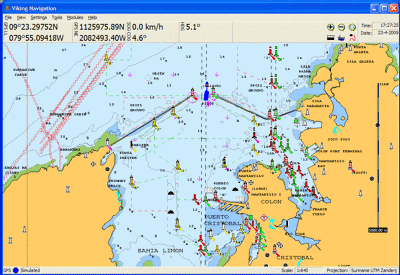 For easy navigation Viking provides, with minimum of effort, access to the complete Navionics worldwide chart database. 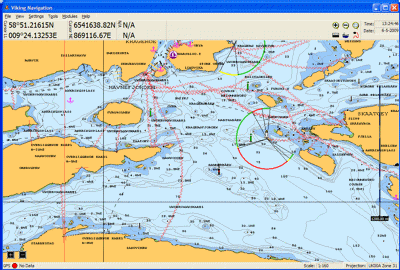 The Navionics database is displayed in high detail and full colour. All charts are vectorized, meaning that zooming in and out will not effect the quality of the charts displayed. Navionics charts are built up of several layers of data, each layer can be switched on or off independently of each other. Allowing you to display only the relevant information. In addition to the Navionics charts, Viking also supports the Viking Chart format. This enables you to create, edit and share customized chart data in any kind of form. For instance, by using the built in Chart Editor you can create and edit charts by drawing, removing and modifying; lines, areas, circles, scaling text, fixed sized text, remarks and symbols. Charts are saved in the Viking Chart format and can be shared between other Viking installations. Or with the special Viking Offline software. In addition to the default features, tools and utilities, Viking also has a modules interface. Using this interface many specialized and customized modules can be added to the Viking system when needed. For example we have developed the Anchoring and Gridding Modules based on clients requests. 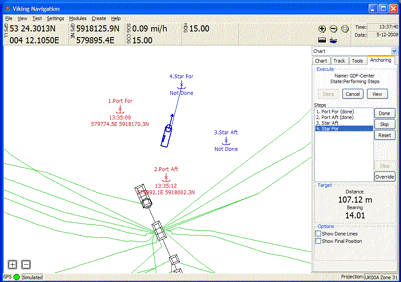 The Anchoring module allows for detailed planning and working with multi point anchoring vessels. The Gridding module keeps track of marked and planned events in a grid layout for special dredging operations. Our Viking software is well known for its constant development process. Combined with the growing request from the industries and ever growing possibilities, our development team is at all times working on new features and software products. Since we have all our software development in-house we have the ability to, wherever needed, build custom features and functionality into our software products, at moderate costs.